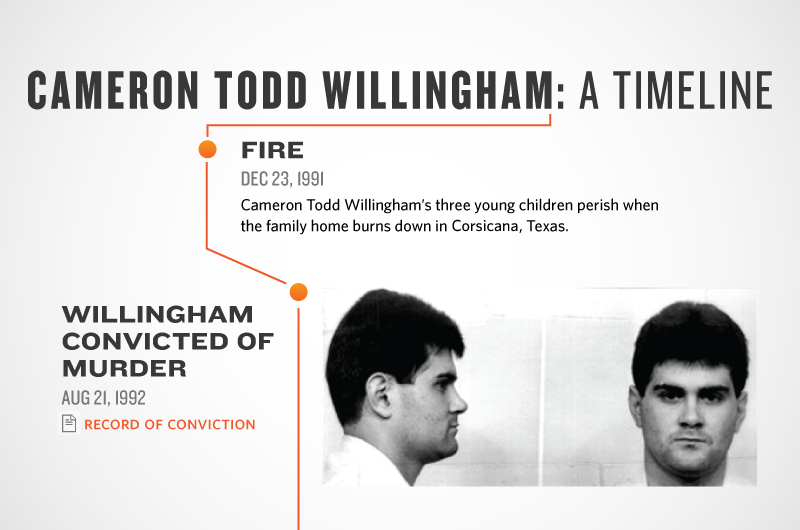 In a major turn in one of the country’s most-noted death penalty cases, the State Bar of Texas has filed a formal accusation of misconduct against the county prosecutor who convicted Cameron Todd Willingham, a Texas man executed in 2004 for the arson murder of his three young daughters. Following a preliminary inquiry that began last summer, the bar this month filed a disciplinary petition in Navarro County District Court accusing the former prosecutor, John H. Jackson, of obstruction of justice, making false statements and concealing evidence favorable to Willingham’s defense. “Before, during, and after the 1992 trial, [Jackson] knew of the existence of evidence that tended to negate the guilt of Willingham and failed to disclose that evidence to defense counsel,” the bar investigators charged. The bar action was filed Mar. 5 without any public announcement. It accuses Jackson of having intervened repeatedly to help a jailhouse informant, Johnny E. Webb, in return for his testimony that Willingham confessed the murders to him while they were both jailed in Corsicana, the Navarro county seat. Webb has since recanted that testimony. In a series of recent interviews, he told the Marshall Project that Jackson coerced him to lie, threatening a long prison term for a robbery Webb was accused of committing but promising to reduce his sentence if he testified against Willingham. Jackson has repeatedly denied that he made any pre-trial agreement with Webb in exchange for his testimony. The former prosecutor acknowledged that he and others made extraordinary efforts to help Webb, but said they were motivated only by concern for a witness who had been threatened by other prisoners because of his testimony. A lawyer for Jackson, Joseph E. Byrne, on Wednesday urged that people withhold judgment about the case until all the evidence was presented and took issue with the grievance filed against his client by the Innocence Project, a legal advocacy group. “I disagree with much of the information that was put together by the Innocence Project and do not find it to be objective,” Byrne said. A staff attorney for the Innocence Project, Bryce Benjet, said the group was encouraged by the bar’s disciplinary action. “Withholding exculpatory evidence and the presentation of false testimony in a death penalty case is quite possibly the most serious ethical breach for a lawyer you can imagine,” he said. The Marshall Project disclosed earlier this month the existence of a letter sent by Webb to Jackson in 1996 asking Jackson to comply with what he called their “agreement” to reduce his judgment from aggravated robbery to robbery. Within a few weeks, Jackson obtained a court order that reduced the charge. The grievance that led to this charge was filed last year after the evidence from Webb about his testimony being coerced first came to light. The Trib had a story last week that reviewed all this and that indicated that the charges against Jackson were coming. Go read that to get up to speed if you need to. As I said when this grievance was filed, we have started to see some rogue prosecutors be held accountable for their illegal actions. It would be a small but fitting piece of justice if John Jackson were to be held accountable for his. The Chron has more.